As its name suggests, a chainsaw is a portable saw that saws through material with a set of saw teeth connected to a looping chain that runs along a guide bar, resulting in a rotating cutting action where all you need to do to cut something is to place it within the vicinity of saw. In regards to finding the best electric chainsaw for you, it's all about knowing what your needs are and which saw is within your budget range. Any self-respecting homeowner should have a chainsaw somewhere around his tool shed, especially if he's a rugged outdoorsy type and his home is more of a log cabin in the middle of the woods. The beauty of a chain saw is that it reduces the manual back-and-forth movement you have to do with a regular handsaw. What's more, it's not as bulky and immobile as a table saw either. Most importantly, an electric saw is much easier to start compared to a gas-powered saw. It might not be as powerful as its gas counterpart, but usually it's powerful enough (depending on power grade) to get the job done and its work efficiency outweighs these horsepower discrepancies. In terms of power grades, here are the electric chainsaws you can avail of. If you want to do light yard work like hedge clipping and tree trimming without getting your hedge clippers out, then a light-duty electric chainsaw is the power tool for you. Their advantages include the fact that they're relatively lightweight at 7-10 pounds and their average horsepower max out to about 3 HP. Furthermore, they're inexpensive yet efficient chainsaws you can easily control and they're also quiet enough to use in most settings. 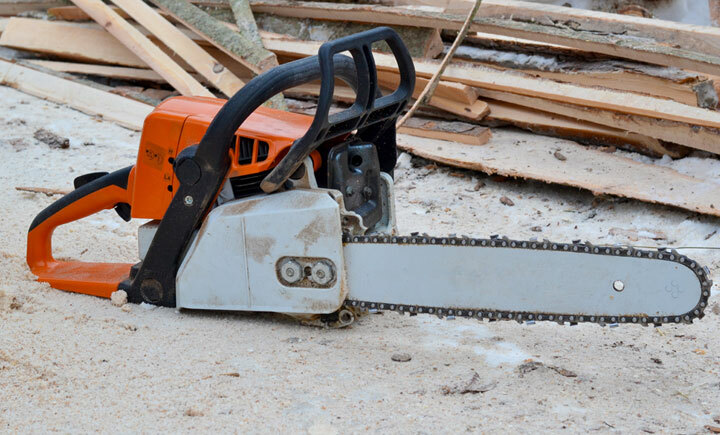 These chainsaws are bulkier than their light-duty counterparts. They also weigh from 10 to 13 pounds. You can consider them an upgrade to your hedge-clipping, tree-trimming electric chainsaw that has improved durability and an increase in power. As such, you're allowed to do heavier work with them, like doing some mild logging and firewood production sans ax. They're still light to wield and has medium HP capabilities to allow for farm work and even mild landscaping. This is the heavy-duty version of electric chainsaws that can give gas-powered chainsaws a run for their money. It has enough horsepower to spare when it comes to heavy-duty cutting and logging. It can weigh as much as 22 pounds in order to have a size of blade, bars, and chain to justify its bigger motor. They're capable of cutting whole tree trunks like your typical gas chainsaw. However, in a home setting, most homeowners who aren't loggers by trade don't require this high level of regular, commercial-level heavy-duty cutting (even with the justification that they're doing home improvement). However, for those who own wide swathes of property or has to make large amounts of firewood regularly, this type of chainsaw should definitely be considered. Obviously, loggers and timber cutters will have immediate use for a pro-grade electric chainsaw. There are also two types of electric chainsaw models available. This chainsaw type is powered from an electric outlet like any regular appliance. These chainsaws are generally more powerful than their battery counterparts, but there are companies who are making cordless models that bring serious HP to the table. Its main benefit is that it's as powerful as you need to be and its main detriment is that it can only go as far as your outlet and cord extension can go (about 100 feet). Therefore, you're limited to cut through nearby hedges and shrubs or the nearest tree at most despite its power advantage. These chainsaws have rechargeable batteries a la a cellphone, so you're given more leeway to use them and they're perfectly mobile to use. 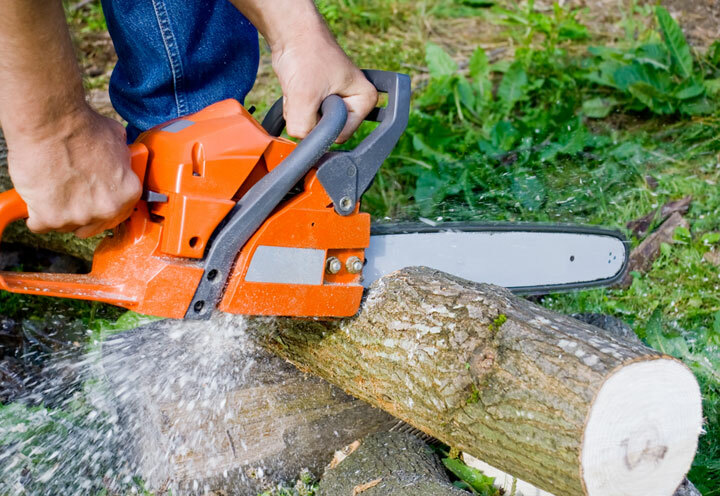 However, despite their improved flexibility when it comes to landscaping (you can bring it with you deep into the woods without lugging around a generator or charger with you), they're usually low-power chainsaws that are more suited to trim down smaller tree limbs or thick shrubbery. However, like their smartphone counterparts, more and more cordless chain saws are improving upon their power grade, becoming more sophisticated cutting machines. Here are some quality electric chainsaws reviewed for your perusal. Right off the bat, the title of the WORX WG303.1 16-Inch 14.5 Amp Electric Chainsaw showcases many of its benefit, like its auto-tension feature that keeps the tension on the saw tight, the chain brake for emergency brakes on the moving saw for safety's sake, and its automatic oiling feature that keeps the saw lubricated automatically so you won't have to do it yourself. The WORX WG303.1 also has a 14.5-amp motor that delivers a cutting performance similar to gas chainsaws. In other words, if you dislike electric chainsaws (particularly corded ones) for their weakness and limited usage, this particular chainsaw is the exception to that rule. Aside from having gas-power-level cutting power for use of ranchers, farmers, and homeowners who wish to cut down nearby trees by themselves, the WORX WG303.1 also comes with a patented auto-tension chain system that keeps the chainsaw from jamming and over-tightening. After using it for hundreds of times, it will still remain with the right amount of tension due to its unique feature. It's also lightweight, quiet compared to gas chainsaws, ergonomically designed, easy to use, and has an aggressive chain with plenty of power. You won't have to deal with oil spills and fumes compared to gas, and like an electric car versus a diesel truck, it's also easier to start. It also lacks tip kickback because of its low kickback bar and a built-in chain brake that keeps you safe from chainsaw accidents. As for the Remington RM1425, its main claim to fame versus the likes of WORX WG303.1 is it's more lightweight and compact than its competition. The gun-sounding brand is more of a light-duty electric chainsaw with the way it markets itself and the fact that it only has an 8-amp motor compared to the gas-powered-level 14.5-amp motor of the WORX WG303.1. What that means is that it's mainly used for small limb trimming and minor landscaping at that power grade. Before buying the Remington RM1425, you should be aware that it's less of a tree cutter and more of a hedge clipper and branch pruning machine than an electric chainsaw with power equivalent to a gas-powered model. This will spare you from having unrealistic expectations in regards to its capabilities. It's also about as safe as the Remington RM1425 with its low kickback bar that's about 14 inches in size. It doesn't have an automatic oiling feature but in turn, it has a push-button oiler that allows you to oil the machine whenever it needs extra lubrication on the chain. Just push the button to oil it. You can also manually adjust the tensioning in accordance to your trimming needs with the assistance of its external chain tension. Also, the unit comes assembled right out of the box so that you can smoothly start your pruning, gardening, and landscaping on short notice after getting the package. As mentioned on the guide earlier, because the BLACK+DECKER CS1518 15-Amp Corded Chainsaw is a corded chainsaw, it has limits in terms of range or how far your extension cord can go (usually about a 100 feet in range). That means you can't haul this chainsaw deep into the woods unless you have a wheelbarrow with a generator and electric plugs to come along with you. Aside from that, the BLACK+DECKER CS1518 serves as an excellent chainsaw in its own right when compared to its competition on this list. For instance, it includes an 18-inch Oregon low-kickback bar and chain (about 4 inches bigger than the kickback bar of the Remington RM1425) for safety's sake. It also has a 15-amp motor. This makes it comparable to the 14.5-amp motor of the WORX WG303.1 (it's more powerful by 0.5 of an amp) and superior to the 8-amp motor of the Remington RM1425. Its chain tensioning can be adjusted with no tools like with the Remington chainsaw and its oiling system is automatic just like with the WORX chainsaw. Meanwhile, you're further assured of safe chainsaw action due to the chain break feature of the saw. For its price and purpose, the BLACK+DECKER CS1518 is a good chainsaw to have. People who are particularly used to using gas chainsaws will approve of this Black & Decker chainsaw's comparative power and better cleanliness. It leaves less of a mess, it's as heavy duty as they come, and it's capable of cutting down trees. This can be considered the weaker or light-duty version of the BLACK+DECKER CS1518 (from the same maker or manufacturer, no less). The Black & Decker LP1000 is a chainsaw with a 4.5-amp motor that has alligator clamping jaws that don't only cut but also grab whatever it's cutting in one motion. This is a feature unique to the LP1000 and it can be quite handy when it comes to cutting hanging or swaying branches that bend or evade your chainsaw when you attempt to prune them. It also prevents you from needed to grab the branch before cutting it, thus keeping your limbs away from the chainsaw blade. The cutting bar and chain is also heavy duty. In other words, they allow multi-pass cutting of thicker branches and logs that are too big for the 4-inch cut capacity of the Black & Decker LP1000, allowing you to do multiple cuts instead to get the job done no matter how thick the log or branch. This allows the Black & Decker LP1000 to give even a mid-range chainsaw like the Remington RM1425 and its 8-amp motor a run for its money. What's more, as expected of a light-duty pruning chainsaw, the Black & Decker LP1000 weighs only 8.38 pounds, which means your arms will get less tired lugging the LP1000 around compared to the heavier chainsaws on this list. This chainsaw makes the most out of its 4.5-amp motor for sure. In regards to the Makita 5012B, it's a "commercial grade" mid-range electric chainsaw that has an 11.5-amp motor powering it (so it's stronger than the other mid-range chainsaw on this list—the Remington RM1425—by 3.5 amps). It's relatively lightweight at 9.5 pounds and designed to be compact to be more ergonomic and easier to wield. It's a little heavier than the 8.38-pound Black & Decker LP1000, but not by much. What's more, despite being similarly sized as the LP1000, it still has specs comparable to a mid-range rather than light-duty electric chain saw when all is said and done. It's a corded chain saw, so make sure to include extension cord costs as part of your budget. The Makita 5012B also features fast-cutting action thanks to its 5,500 FPM chain speed and housing that's made of polycarbonate material. Meanwhile, the smoothness of the chain action is ensured due to a special sprocket installed within the end of the chain bar. It even has a hand protector to shield your hands from flying chips and debris, thus increasing your safety. Most importantly, it's less likely to break down because unlike all the other chainsaws on this list, it also includes a built-in overload protector to boot. You should also buy this particular mid-range chainsaw if you want the grips to be well-positioned and ergonomic so that you don't end up with cramps after wielding it. Chainsaws are machines that can save you loads of energy, money, and time because they're capable of clearing huge swathes of bushes, branches, and logs or at the very least they can double as your automated hedge clippers depending on its power grade. Buy a corded, cordless, light-duty, mid-range, and professional chainsaw depending on your specific requirements.